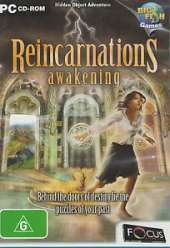 Jane is a journalist for a fashion magazine, that receives a commission to write an article about reincarnation. The research for the piece leads her to the mansion of Dr. Herzle, a famous and reclusive scientist. He offers the opportunity to use a special hypnotic technique to explore her past lives. This is an adventure and hidden object game with simple puzzles tailored for the casual market. The locations are presented as in most point-and-click, first-person adventures, where the player can navigate between a series of static screens by clicking on exit hotspots, usually positioned on logical places like doors and other openings. Some portions of the scenery bring up one of the hidden object challenges, where the objective is to find and click on all the items listed at the bottom, on places cluttered with assorted paraphernalia. Some of the entries are marked in orange, to indicate that an extra step is necessary before collecting them. The hint button draws a red circle around one of the required items, but takes some time to recharge after use. Some of the objects are stored in the inventory at the bottom, from where they can be dragged and dropped on the correct and logical place to perform an action or solve a puzzle, like using a key to unlock a door. Some of the puzzles take place on a separate screen, where mechanisms have to be directly manipulated directly to solve them. They can be skipped after a few minutes.